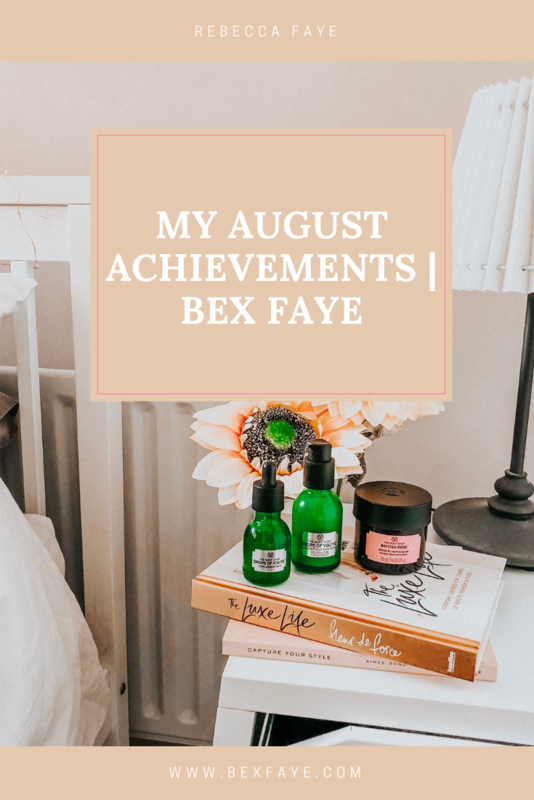 I’ve never really written a post like this at all before, mainly because I probs don’t feel like I’ve acheived much, but August for me has been one of my best months blogging wise. I wanted to share with you some things I’m really proud of and talk about some goals for the next month/ rest of the year. I don’t normally set myself goals but i think I’m going to start doing so, so I have something to work towards. So most of you know I work full time in a marketing role, and my blog/ Instagram is something I work on in my ‘spare time’. Note that spare time is in quotation marks because I rarely get any ‘spare time’ so sometimes it honestly feels like I’m working all the time. Days, evenings, weekends, pretty much all my time is occupied. But, I wouldn’t do it if I didn’t enjoy it and when I see great results and achieve great things, I guess all the hard work is worth it in the end. Recently, I’ve really been putting more time and effort into my blog. Posting more frequently, taking photos and working on SEO on my posts. And ever since I’ve worked on my SEO, posted more frequently and been more active on my social media – I have seen actual results. Firstly, I wanted to share the news that I am now officially a Body Shop Brand Ambassador which means I get to try lots of Body Shop products from their hair, body and makeup range etc an I get to share my thoughts with you over on Instagram! So make sure you follow me on there if you haven’t already to see the latest from my Body Shop posts! This is such a big deal for me as I absolutely love The Body Shop and I feel so super lucky that they have chosen me of all people out there to come on board this scheme! I have already been trying out the banana shampoo and conditioner (and wow does it take me back to being a young girl again!) and the matt lipstick which is so me! Another amazing collaboration came about towards the end of the month, when I received an exciting email from Ted Baker. I mean, I nearly screamed when I saw that pop into my inbox. Ted baker is such a luxurious, classy brand and I feel so privileged to be even considered for campaigns they are working on. You will see on Instagram when I post about the campaign but I am just so excited to shoot content for this brand. This is possibly the most exciting news as it hasn’t come about by luck, it’s because I’ve worked bloody hard, BUT… I hit my highest number of blog views in August and I honestly cannot be happier! I know it’s not always about number of views etc, but to see my views increase due to hard work then that is a success in my eyes. There are a number of reasons why my blog views are at it’s highest I can imagine and that because I’ve been posting more frequently, I’ve shared more on my social channels (linked below) and I have been opitimisng my posts for SEO so my blog views are coming from organic traffic! I know this is kind of a random post and not something I would usually post about, but I really enjoy reading about other peoples achievements and I think it’s good to have these to look back on in a few years! Do you have anything exciting to share from August?